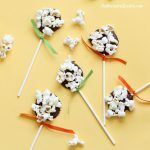 A fun popcorn football cake for your Super Bowl party. So I know that right about now lots of interested people are watching that brown-ball throwing and tackling game. I am not one of those interested people. I once fell asleep at a football game and if you ever make me go to another one, I promise I’ll fall asleep again. But I do love the food associated with all those football-y gatherings. 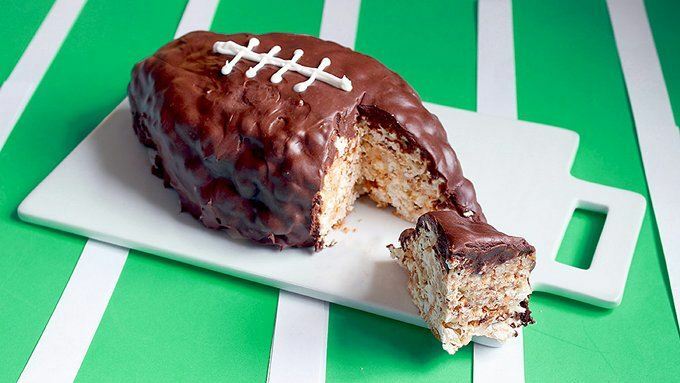 Oh my word, this butterscotch popcorn football cake is ridiculously delicious. Like really good. 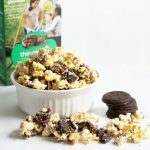 Like cereal treats, only with salty popcorn and butterscotch and chocolate. I would even watch (part of, like a very small part of) a football game to have a slice of this. 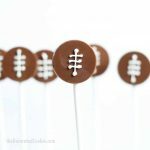 Visit Tablespoon to make the Butterscotch and Marshmallow Popcorn Cake football. Looking for more party food?